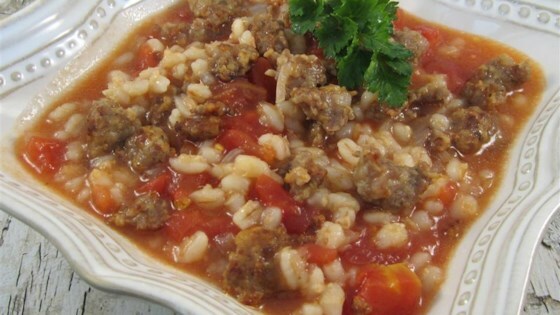 "The best beef barley soup. Thickens with just the barley. Tastes best in the slow cooker. Serve topped with parmesan cheese and with a salad." In a slow cooker, combine beef, water, bouillon, onion, tomato sauce, barley, salt and pepper. Just wonderful! I did add a bit of red wine,fresh thyme, bay leaf, minced garlic, and carrots to the beef broth. I also browned the beef before I put everything into the crockpot. Thank You! Great recipe! I love the way it thickens up and the beef is so tender. I did add celery, carrots, onions, and garlic. Also added a bit of red wine. Very good and filling. Delicious! I added extra onion, and stirred in some fresh spinach right before serving to increase the vegetables, and it was great.